Where Did All This Pentecostalism Come From? (Tim Challies) It is impossible to consider the modern history or contemporary state of Christianity without accounting for the sudden rise, the explosive spread, and the worldwide impact of Pentecostalism. To that end, I’ve been reading several books on the subject, focused especially on the Azusa Street Revival, which most historians consider the setting in which Pentecostalism began. Here are a few key points I’ve learned about the Azusa Street Revival and the Azusa Street Mission that housed it. Its roots were in the Holiness Movement. 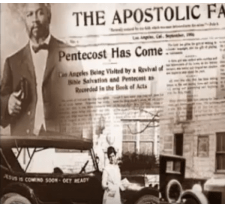 The roots of the Azusa Street Revival and the Pentecostalism it birthed are entwined with the Holiness Movement of the late nineteenth century. This was a renewing movement within the Wesleyan tradition that emphasized complete sanctification and taught that moral perfection is available to Christians. It was marked by a heavy emphasis on personal holiness, most often displayed through a close adherence to the law as a means of drawing near to God. In general, early Pentecostal theology took Wesleyan theology as its starting place, then added to it certain new elements.